ATACS 5117: SYNTACTIC POTTING COMPOUND « Atacs Products Inc.
ATACS 5117(EY-2676A/B) was developed for use in potting threaded inserts in Honeycomb panels and for edge filling Honeycomb panels. 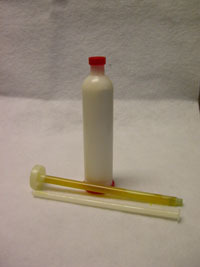 The two components are generally delivered in a “dasher rod” two part cartridge kit. It is specially formulated to provide excellent extrudability and slump resistance. As with all resin systems, liquid and vapor may cause irritation to some people. Avoid contnact with skin and use adequate ventilation. Wash skin with soap and water. Flush eyes with water copiously and get medical attentioin. ATACS 5117 can be stored for 6 months in sealed containers between 60° F. to 90° F.
MIX RATIO: Mix 100 parts by weight of Atacs 5117A(EY-2676A) to 15 parts by weight of Atacs 5117B(EY-2676B). The cure cycle of ATACS 5117 is 7 days at 77° F., or 5 hours @ 125° F.